A new exhibit shows photographs rejected by censors from TASS, the official Soviet news agency. Between 1970 and 1990, the TASS news agency was responsible for showing the world the official view of the Soviet Union. And, unsurprisingly, there were pictures that, while not seditious, did not exactly toe the ideological line. An official Soviet photographer had to be careful when choosing the right reality to photograph: every scene had to fit into a spectrum that ranged from “their country is proud of them” to “they get in our way.” A new exhibits magazine offers what fell between the two extremes—often not on purpose, but simply by chance. The photos make viewers today aware of the tenuous boundary between Soviet and non-Soviet style, a boundary that was not very clear even to the TASS censors, who had been trained to detect any covert sabotage. Igor Zotin, 1990. “The Lesson.” Rejected because it allegedly discredited the Communist Party’s rural policy. The picture shows children in a rural school. They are dressed in their Sunday best, but there are embarrassingly few of them in the classroom, suggesting that the rural population was dying out. The classroom leaves the impression that secondary education in the Soviet Union was financed on a shoestring. Valery Khristoforov, 1979. “The Cordon.” An act of ideological sabotage. It was inadmissible to show the public that cheering crowds celebrating are cordoned off by soldiers: Soviet people have no need to for protection from anyone, and no one needs to be protected from the people marching in the columns. The Soviet Army is part of the people. And of course, nobody should see the army’s back. Igor Zotin, 1988. A fatherly gesture is inadmissible frivolity. The Soviet Army’s Main Political Directorate (GlavPUR) was the toughest censor. For example, it demanded that the soldiers’ tunics in all war films must be buttoned up tight. This photograph shows a dozen minor ways in which army regulations are broken. The officer has the earflaps of his hat up while the soldiers have them down; instead of bawling out a soldier for having his hat askew, the commander adjusts it himself. From there it is but a step to a breakdown of all army discipline. Boris Kavashkin, 1972. To roll up a banner is to desecrate the words written on it: “The People and the Party are United.” After the end of a popular demonstration, every participant was supposed to bring the festive paraphernalia—flags, banners—back to the one in charge of their safe keeping. Valery Khristoforov, 1987. Photographing a boarding school for disabled children is denigration of socialist reality. 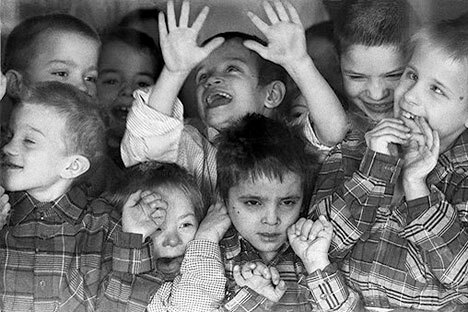 The look of the boarding school pupils was supposed to prove that, in the Soviet land, all children are guaranteed a happy childhood: they have to be cheerful, well-fed, neat and trim. But the existence of boarding schools for disabled children and even of these children themselves was inadmissible. There should be no disabled or terminally ill children in the Soviet Union. The children’s smiling faces cannot quite erase the photograph’s grim message. Boris Kavashkin, 1979. A snapshot taken inside a commuter train amounts to propaganda of the Western way of life. A young girl smoking a cigarette and wearing obviously Western-made red slacks with a striped sweater and a young man in jeans cannot be representative of Soviet youth. Needless to say, occupying the luggage rack and smoking inside the carriage are gross violations of the rules for traveling on commuter trains. The exhibit lasted from march 25 till april 17, 2011 at Fotodoc art center.